The Eights are about action and change. Breaking the inertia to gain momentum which is often a difficult thing to do. Eight of Pentacles is the card of the Apprentice, or the Neophyte, and speaks of the hard work that lies ahead. This card requires of us to get out of our comfort zones in order to learn or re-learn whilst taking the necessary action required to do so. An apprentice who dedicates himself to learning a new skill or task often feels frustration when faced with repetitive tasks that are seemingly unimportant or unglamorous, tasks that are often at the ‘bottom of the ladder’ as it were. This is true especially if his teacher is thorough and a stickler for creating a solid foundation of knowledge in the Neophyte before he is allowed to spread his wings. There is something quite honest and refreshing about the apprentice who learns a skill that will stand him in good stead, if he is dedicated. And few things are admired as much as someone who truly knows his subject and who delivers the work expected of a qualified tradesperson. A good apprentice does not mind doing the hard work necessary to develop the skills needed to become one who is really good at what he does. Most skills learnt will improve his life on one level or another, and hard work is most definitely a requirement if anyone is to learn something new. We’ve all been there, or are perhaps going through this again. Through trial and error we learn, we are at times perhaps humiliated as we learn what others seem to do so well, but we need to remember that they too were once apprentices and had to do the work necessary before they could excel in their chosen fields. Upon joining a Pagan coven, for example, much learning is required from the Neophyte before he can expect to become a fully contributing member. Responsible Pagan Elders or circle leaders will insist that each new member learns the basics first before being allowed to manipulate energies in circle or exert their will on creation. Even a respectable and wise Pagan Elder is forever learning or re-learning skills. Be those divination skills – like the tarot – or skills that fall into the camp of Magic, whether sympathetic or ceremonial, each has it’s own set of skills that are needed. Once we have acquired the necessary skills we can move on to become accomplished in our field of expertise. We can then look back at the challenges that we faced during our apprenticeship with pride and knowledge. With hard work we have ensured that our foundation is solid. Only then can we truly make a meaningful contribution. 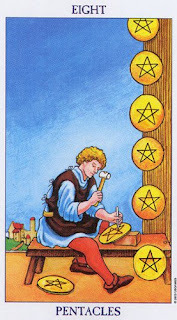 With the Eight of pentacles visiting us today we could challenge ourselves to learn something new or to brush-up on skills that we have not used in a while, perhaps they have become a little rusty or outdated. Perhaps we want to learn how to build a website, or how to ride a bicycle. Or we may have some larger task ahead of us for which we may need to undertake an apprenticeship. Many of us who are interested in leading healthier lifestyles for example may need to learn about nutrition and exercise. Someone who feels he may be stuck in a dead-end job may want to consider expanding their knowledge by going back to college or learning a trade. Of two things I am certain, we never stop learning and we can only improve our lives when we embrace opportunities to learn more.